Matter of Trust is the fiscal sponsor for Veggie Van.org, whose founder, Josh Tickell, is from Louisiana. 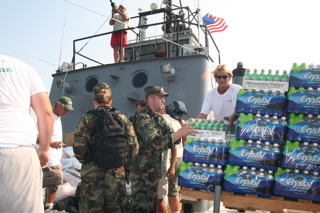 After the hurricane struck, thanks to the coordinating efforts of Josh and many volunteers, biodiesel providers got fuel to supply boats and diesel trucks when conventional fuel wasn’t available. Thanks to Josh and the team for the donations of food, clothing, and necessities that reached remote areas and many grateful residents! For continuing in-kind relief efforts—wishes and gifts see our Excess Access program.